Mountain Bar No-Bake Cookies are a very chocolatey and chewy no-bake cookie. It is very similar to a fudge recipe. You cannot go wrong with the primary ingredients of chocolate and peanut butter. These cookies are easy-to-make and require no baking and are gluten-free. Children seem to love these cookies and can never seem to get enough. When my daughter, Nancy, was a child, this was her favorite cookie to make. You can also reduce the fat and sugar by substituting with Splenda and low-fat peanut butter. You can also vary the recipe ingredients and try adding coconut, cinnamon or nuts to the recipe. This photo was shared with me by my sister, Carol Arroyo, and her website The Baking Pan. More favorite Cookie Recipes and Secrets To Making Perfect Cookies. Also learn How To Have A Successful Holiday Cookie Exchange or Cookie Swap. Line a cookie sheet with parchment paper or the Silicone Baking Mats to prevent the cookies from sticking. In a large heavy saucepan over low heat, add sugar, butter, milk or water, and cocoa powder; stir until melted. Increase heat to medium-high and bring just to a boil, stirring constantly so the mixture does not burn. Remove from heat. Add peanut butter, oats, and vanilla; stir until well mixed. While mixture is still warm, drop dough by rounded tablespoonfuls onto the prepared baking pans. Let sit until cool and the chocolate is hardened. What could be easier and simpler than an old-fashioned oatmeal cookie? Easy-to-make and always delicious! I like adding raisins to this simple version, but you can add nuts and/or chocolate chips if desired. My daughter says this are the best Cowboy Cookies ever. Once you make them, I know that you will agree with her. This cookies are also known as Cowboy Cookies. 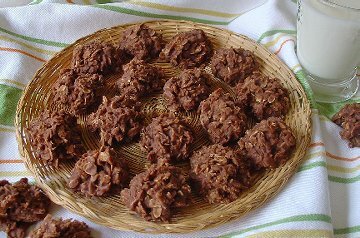 Delicious and healthy cookies with the use of squash and oat meal. This is a wonderful version of oatmeal cookies.